Highlighting the diminishing number of freshwater species in North American rivers, American Rivers released its annual list of the nation's Most Endangered Rivers on Monday. Dams, levies and stabilized riverbanks have destroyed river habitat and greatly contributed to the potential extinction of native fish and wildlife, according to a report by the conservation organization. "These rivers all have problems connected to the way people have managed them," said American Rivers President Rebecca Wodder. "We have straightened the curves, blocked the flows and hardened the banks of thousands of miles of waterways — so fundamentally altering our rivers that many are hardly rivers anymore." Recent studies show that freshwater fish and other species in North America's rivers are vanishing as fast as rain forest species, American Rivers said. The fish, snails, amphibians, mussels and other animals that live in North American rivers and streams are disappearing five times faster than animals that live on land, according to Anthony Ricciardi of Canada's Dalhousie University, who published his research in the October 1999 issue of Conservation Biology. Snake River salmon and steelhead are among those species. Four federal dams on the lower Snake River, have brought salmon and steelhead runs in Oregon, Washington and Idaho to the brink of extinction, American Rivers said, reducing fish populations by nearly 90 percent. Due to the imminence of the Clinton administration's upcoming decision on whether or not to remove the dams, American Rivers named the lower Snake River the nation's most endangered river for the second year in a row in an emergency announcement on March 10. 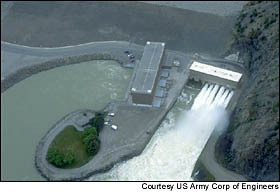 Lower Snake River in Oregon, Washington and Idaho; dam operations. 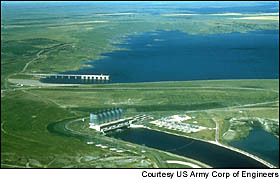 The Missouri River in Montana, North Dakota, Nebraska, Iowa, Kansas and Missouri; dam operations, channelization. The Ventura River in California; dam operations. The Copper River in Alaska; proposed logging road. The Tri-State River Basins in Georgia, Alabama and Florida; excessive water consumption, dams, sprawl and pollution. The Coal River in West Virginia; mountaintop removal mining. The Rio Grande in Colorado, New Mexico, Texas and Mexico; excessive diversion and over-consumption of water, flood control and irrigation projects, land development and pollution. The Mississippi & White Rivers in Minnesota, Wisconsin, Illinois, Iowa, Missouri, Kentucky, Tennessee, Arkansas, Mississippi and Louisiana; flood control and navigation projects. The North Fork Feather River in California; hydropower dam operations, transfer of dam ownership and electric industry deregulation. The Clear Creek in Texas; flood control project. The Green River in Colorado and Utah; dam operations. The Presumpscot River in Maine; dam operations. The Clark Fork in Montana; proposed mine. For the past 15 years, American Rivers has reported on rivers in North America that face immediate and severe environmental degradation. When selecting candidates for the list, the organization looks at the magnitude of the threat, how imminent the threat is and any impending decisions that happen to be on the agenda for that year. "The purpose of this list is to shed light on rivers ... in trouble and to alert the public about upcoming decisions," said Wodder. "We have a number of key opportunities this year to restore our rivers and the native fish and wildlife that call them home." Wodder said the list is especially important on the eve of the 21st century. "In the 18th, 19th and 20th centuries there was a utilitarian view of rivers as [mechanisms] of power and transportation. As we move from the industrial age to the information age, we hope that rivers can serve a higher purpose."